Serena Williams and her fiancé, Reddit co-founder Alexis Ohanian, welcomed their baby girl into the world yesterday. And social media lit up with celebrities and athletes from the tennis world eager to offer their congratulations to the proud parents. One of the first stars was mother-of-three Beyonce, who shared a snap of the 35-year-old during her pregnancy wearing a white dress with a billowing train. 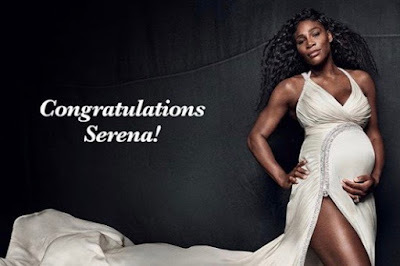 The words 'Congratulations Serena!' were superimposed on the image. 'You Reddit here first!' Wendy Williams joked referring to Alexis. 'Congratulations!